Our Christmas Special continues today with a fabulous idea for a super easy dessert (hint: Dr. Oetker has something to do with it). This one also involves oranges. Wait until you see it, guests will think you slaved over this one. Fool them! This dessert, Chocolate Mousse a l'orange, is easy to prepare ahead of time, so you are not stressing out trying to roast, cook, bake, etc. at the same time before the dinner guests arrive. In the photo you notice some orange puree to the left of the orange. This is an additional step for which you can heat up the orange flesh and add a little bit of Grand Marnier or Cointreau if desired. I found this kind of unnecessary and not worth the extra effort. This dessert can be all about the Mousse and the presentation. Start by cutting the orange tops off at the point where the fruit gets wider (as opposed to just the top). Then slice another 1/2 inch thick piece for the star cut-out. Don't make it too flimsy or the peel may rupture. Use the metal cookie cutter to stamp out the star shape in the middle of each slice. The next step is to hollow out the oranges. This is easiest by running the paring knife around the inside, carefully extracting the flesh. Again, be careful not to cut too much away or the orange shell may break. Cut the bottoms of the orange bowls off just a little bit to stabilize them (if necessary) but without making a hole. Pour the milk into a bowl and stir in the chocolate mousse mix. Using a hand mixer, mix the milk and the powder first at low speed until combined, then at the highest speed for 3-4 minutes until creamy. 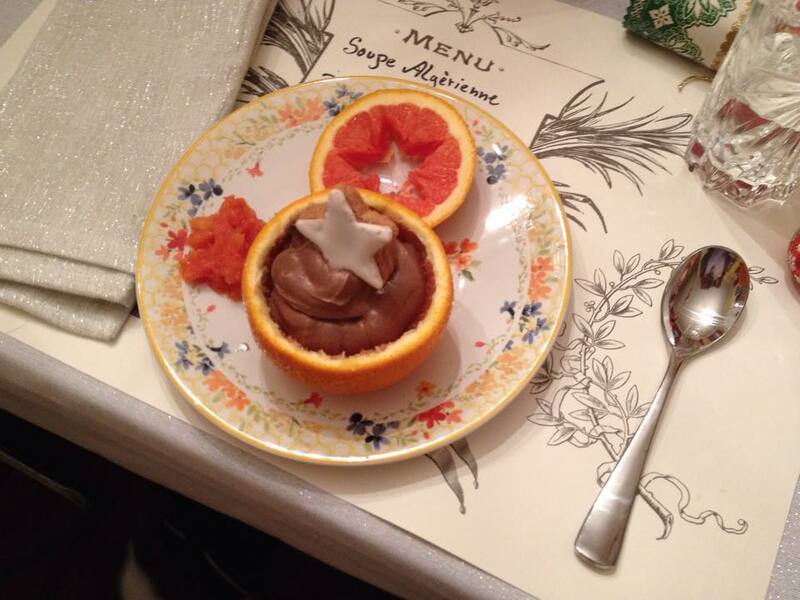 Spoon the mousse into the orange bowls. Arrange on individual dessert plates with the star-slices on the side. Top with the star cookies right before serving. Enjoy the oohs and aahs from your dinner guests!